Earlier this year we shared a DIY Alkalinity Monitor created by David Cheng. Since then we have been keeping a close eye on this unit, along with other similar devices for monitoring alkalinity. Fast forward to today and we now have a production model of David Cheng’s device produced by Dr. Bridge available to hobbyists in the US through Coralvue. Why would you want such precise control over alkalinity? Besides the actual salinity of your aquarium water, alkalinity is arguably the most important parameter to monitor. 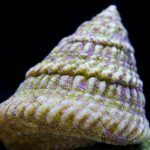 While corals sip away at the excess amount of calcium present in seawater, the relatively small amount of available alkalinity is gulped down which can have drastic effects on our corals. 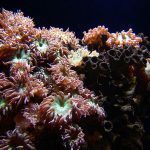 The target number is of little concern within reason (unless you’re still on the ultra-low-nutrient system bandwagon), however, the consistency of this level is something that all corals crave, and some corals require. In heavily stocked fisheries alkalinity is of huge concern in regards to the potential of pH swings, but that’s beyond the scope of this article. 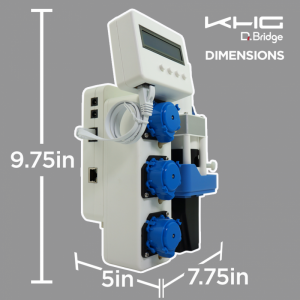 Not only does the KHG monitor alkalinity, it controls the dosing. In fact, it cannot only monitor at this time, the control is necessary. 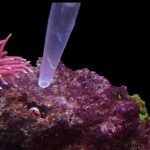 After a phone interview with Carlos Chacon of Coralvue, we have learned that this dosing is done with tried and true sodium bicarbonate, which can be easily sourced in bulk by aquarists. Have a calcium reactor running like a top already on your aquarium? No problem! Use the KHG in conjunction leaving the reactor to do the heavy lifting while utilizing the constant fine-tuning capabilities of the KHG to keep rock solid alkalinity. The same can be said for two-part users, however, an additional sodium bicarbonate reservoir is required for the KHG control, it cannot use other commercial supplements. 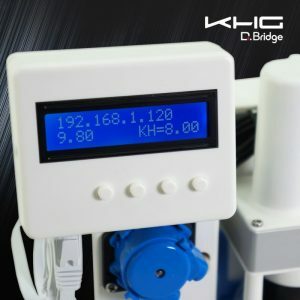 The KHG uses a standard pH probe for part of its internal calculations. A proprietary reagent is slowly added to a test vial which drops the pH of test water just below 4.5 and from there the dKH value is computed. As most reefers know this means that it must be calibrated to keep in good working order. Carlos mentioned nothing out of the ordinary for this process, less the fact that we would use the lower end calibration solutions (4.01 / 7.01) rather than the higher end (7.01 / 10.01) used to actually monitor pH in reef aquaria. pH probe lifespan is on par with that in most controllers, meaning the standard grade probes should be replaced every six months, and lab grade probes every twelve. Any pH probe with the industry standard BNC connector can be used, which is a welcomed attribute. The KHG can test in intervals of every thirty minutes, up to every two hundred and forty minutes (four hours). Carlos advised to stick with the longer intervals which we fully agree with, as an alkalinity test every four hours is more frequent measurements than any aquarist I know performs. Besides that, alkalinity really won’t shift much within that time frame, and we want to extend the life of our reagent to keep costs down. The KHG reagent packets available from Coralvue produces over 1,500 grams of reagent, which will last in the neighborhood of 30-45 days. Reagent refill cost is $34.99. Surprisingly, the reagent is claimed to be “Bio-Safe” meaning the tested water can be shot right back into your aquarium. 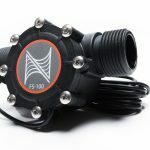 If your eyes are bugging out of your head like mine were when I was told this, you can absolutely have another reservoir for the test water, can connect it directly to a drain line, or connect to your skimmer collection cup to be dumped out later. Each test uses a 23 mL sample of tank water (equals ~.04 gallons per day at 4-hour test intervals), which needs to be compensated for somehow if you’re not putting test water back into your aquarium. 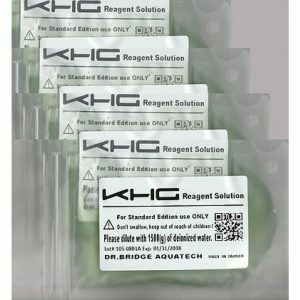 Several reefers have been using a KHG for over a year, dumping the test water back into their aquariums with zero ill-results. 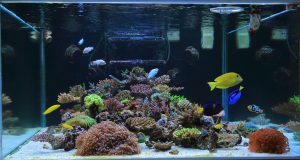 Reef aquarium of Wang Zheng Yi, who’s been using the KHG for over two years. See a video of this aquarium below. Final notes on the unit include the necessity to mount within thirty inches of your aquarium. We do not want sample water to be sitting in the line, or the purging process to be extended dramatically. Also, the unit must be mounted perfectly level in order for proper operation. If you’re a perfectionist like myself your sump is probably already level, so setting on top is adequate. There was mention of Dr. Bridge being in the process of building a mount for the device that will include a leveling mechanism making this requirement quick and painless. Retail pricing of the Standard Model is $1,069.99 (accuracy +/- 0.3 dKH) and Pro Model is $1,269.99 (accuracy +/- 0.1 dKH). Coralvue is offering introductory pricing of the Pro model for $1,069.99 for the first one hundred units sold. The resolution of the Pro Model is 0.1 dKH. Continuous measuring test accuracy is +/- 0.1 dKH. Use only one reagent for each test. The used reagent goes directly to the aquarium without any safety concern. Each test only takes around 3 ~ 4 cc. reagent. 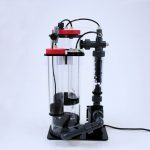 Automatically calculates how much sodium bicarbonate solution should be added to the aquarium with the reference of the desired dKH target value, aquarium total water volume and current testing value. Then the controller doses the sodium bicarbonate solution accordingly. This is an amazing tank that has been running for over 3 years with the help of the KH Guardian. 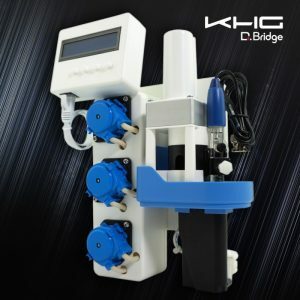 The KH Guardian is an Alkalinity monitor and controller that helps keep the system at a stable 7.5 dKH creating a stable and optimal environment for coral growth and striking coloration.